After spending this past month bouldering at Erratica, I realize that this is the season for the hard climbing here. I managed to do a few new lines this weekend. If anyone has heard of Element of Surprise v11, it was an old FA of mine from last year that never got repeated. One day last summer Fernando Motta broke a key hold off the beginning crux section making it seem impossible. 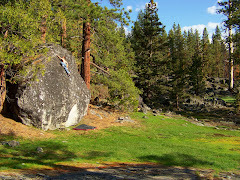 The other day I pulled off the new FA and redubbed the line Hellamental v12; it is definately harder than it was. The first move is a really long windmill up a steep wall to deadpoint a pinch. From there a short v9ish finish awaits. The next day I went out with Jason Hogan to do some filming for more FAs. I did the first ascent of the sit start to Global Warming. This new start takes it up to solid v10 probably. Crimpy and powerful in the start to its classic technical finish. We finally have our warm up problem Noah. After that I hiked up the steep trudge to the Shade Grove Boulder where I did the second ascent of Josh Neuman's line Balls of Steel v12. This line was hard for me and I've been working on it for quite a while. The sit start is still a major coveted project which I came really close to sending. After multiple attemps the razor blade hold started to destroy my skin and I had to save it for another day. I can't wait to go back for this one. It is truely a hard classic. Most of these FAs were caught on film. Jason Hogan filmed the latest lines and they will most likely end up on either vimeo or in the Mikey Weir film, Green Rush. I got some of the early FAs on tape and have made a video showcasing winter bouldering in Erratica. I hope everyone enjoys it. Despite new snow falling soon. I plan on spending a lot of time out at Erratica trying the sit start to Balls of Steel. This climb will be a big send for me if I ever do it. Winter in Erratica from Jesse Bonin on Vimeo.